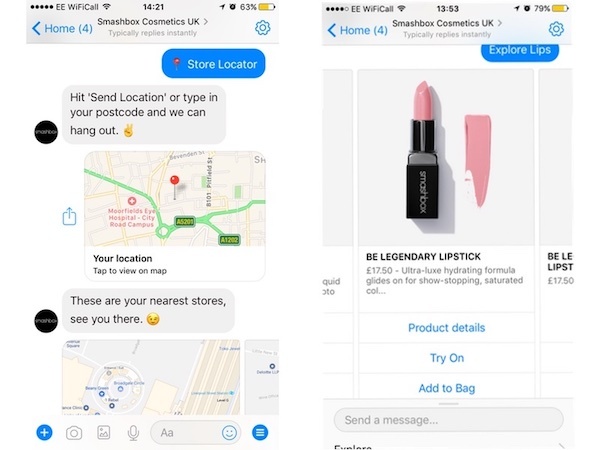 LA cosmetic brand Smashbox has launched the first Facebook Messenger chatbot in the UK allowing users to try-on its full range. Through this service, Smashbox – who by the way named their chatbot "Smashbot" – allows a skeptical target group of possible new customers to get into contact with the brand without making the commitment of installing an app, as the bigger part of the target group already has the Facebook Messenger app on their phones. This increases the possible user group of the service and adds a possible new touchpoint for deeper engagement with the Smashbox products along the customer journey.